This hike was, by far, the best hike of the year so far. I know, there have really only been 4, but it was just what I needed at this time. This hike included my aunt and my better half, which definitely didn't hurt as well as the first appearance of Chewy the Dog on a #52hikechallenge hike. The setting is rural, just outside of town and the park is large enough that once on the trails we didn't hear a thing from the main gate. The trails we chose were the Cedar Ridge trail with parts of the Cedar Brake trail and the Buckeye trail. To begin, you park in a small lot near the campground entrance. From there you make your way down to the river and you must cross. The water was gentle and relatively low, so we made it without any major wet feet. From there, the elevation climbs and you begin hiking the ridge overlooking the river. The trail meanders through junipers and over the rock formations. Along the way you'll find hike-in campsites, which look appealing for a potential camping trip this year! 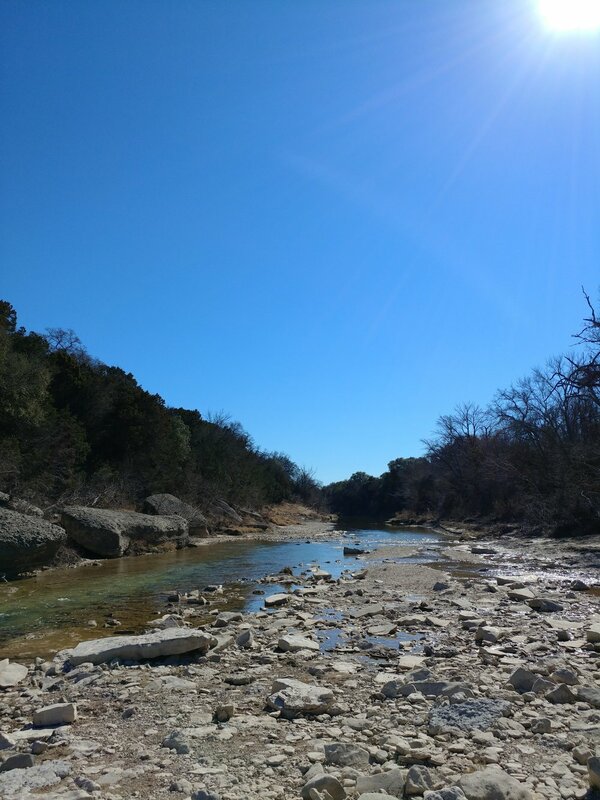 This hike was far away from the DFW metro area and that was the selling point. The woods was quiet - I could hear the wind through the trees, critters stirring, birds in the bushes, and the ground beneath me feet as I trekked forward. I didn't hear cars driving, horns honking, too many other people in general, or anything else annoying. The land was clean, free of trash, and it smelled fresh. All in all, it was just a wonderful day at peace with nature. I'm attaching some photos and highly recommending this place for anyone that wants a relaxing, yet adequately challenging hike.